ole takes the position that evil itself may in fact not exist, and works from the concept of the idea of evil, which most definitely does exist. 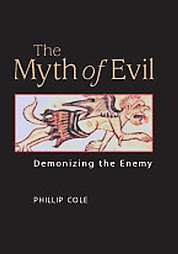 He closely examines traditional explanation of evil as a force which creates monsters in human shape as well as the notion that evil is the result of the actions of misguided or deranged agents and finds fault in both; evil is a myth, he writes, that we have created about ourselves. In the process he faces such evidence of evil as crime, war, genocide and violent perversion, leading to an evaluation of the evil currently assigned to terrorism." "He offers a concerted and impassioned challenge to the view that notions of innate sinfulness and pure evil are psychologically convincing or, for that matter, of practical use…. [C]ole offers much…. [f]ood for thought in his tour of writings on evil." "Cole has written the best book on evil to date; it deserves a place on the shelves of both academic and public libraries. The author considers the literature on evil from mythology to Buffy the Vampire Slayer, including recent philosophical works….Three major arguments emerge from this extensive review, all of them cogent. One is that the concept of evil is not only a meaningless concept that adds nothing to an understanding of human behavior, but also a dangerous one because it obscures possible understanding of events. The second is that the notion of evil is a mythological concept, not a religious or philosophical one. Evil is part of the story that humans tell to make sense of their (as opposed to others') world view. The third is that stories of evil arise from fear of the unknown that humans feel is threatening them. This unknown can be metaphysical or political. Cole ends with a chapter on contemporary politics and the evil of terrorism, an expression he would strike from the language. Essential. Upper-level undergraduates through faculty/researchers; general readers."